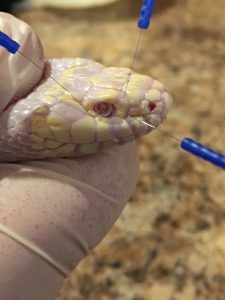 Abstract: A 6 year old female Leucistic Kingsnake presented for acute onset OD (right eye) enopthalmia which was diagnosed as trigeminal and facial neuritis secondary to trauma to the right side of the skull. 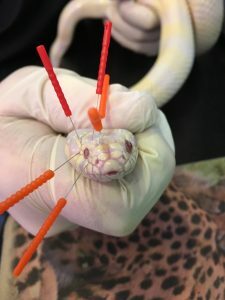 After being treated aggressively with acupuncture once a day for 3 days at points to stimulate the trigeminal and facial nerves, innervation and function to the right eye was restored. 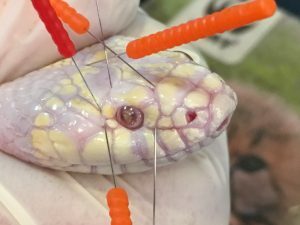 Terry is a 6 year old female leucistic kingsnake that presented for acute onset OD (right eye) enopthalmia with no clear etiology. The sunken appearance of the surrounding facial tissue was noted by her keepers to have occurred over a 2-3 day window and rapidly progressed. No overt trauma was observed prior to this and no changes in environment, husbandry, or diet had occurred. 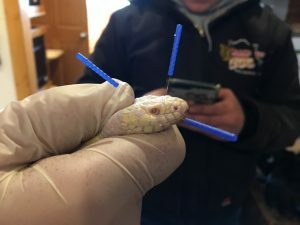 This animal had been healthy with no medical concerns prior to this event. Due to the rapid onset and deterioration of the eye, flurbiprofen was initiation BID q7d along with acupuncture once a day for 3 days in attempt to restore nervous innervation to the eye, stimulate bloodflow to the surrounding connective tissue, and stimulate the facial and trigeminal nerves in an attempt prevent it from deteriorating further with the highest goal to restoring nerve function to the eye. Radiographs were performed to r/o or r/in neoplasia vs trauma and showed evidence of trauma to the bones of the right maxilla and no evidence of masses. This confirmed trauma as the etiological cause and primary neuritis and keratoconjunctivitis sicca through trigeminal nerve and facial nerve damage as the definitive diagnosis. These points were chosen in order to prioritize stimulating the trigeminal and facial nerves with particular attention to ophthalmic branches and surrounding connective tissue. 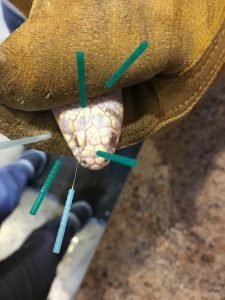 With anatomy being slightly varied in the snake, points were given priority that were easiest to anatomically assure accurate and placement to assure effectiveness of the treatment. 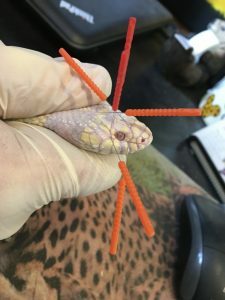 Certain points could not be added due to zookeeper hand placement during manual restraint. GV 20 was always placed first as a calming point prior to starting acupuncture at other points. More points were added each day as the patient became more amendable to additional needles. 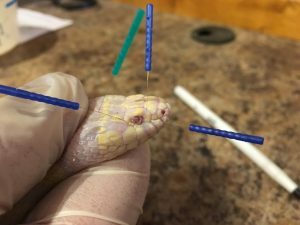 Dry needling was the only method utilized as electroacupuncture and laser therapy equipment was not available. Needles used were Seirin J-type 0.10X15mm, Seirin J-type 0.12X15mm, Seirin J-type 0.16X15mm, Seirin J-type 0.18X15mm, Seirin J-type 0.20X15mm. The right eye progressively improved with each treatment and innervation and nociception returned to the eye by day 2. The surrounding tissue remained sunken, but the eye itself is no longer enopthalmic. The tear glands returned to function. The fibrin within the anterior chamber is permanent and will decrease field of vision, but the patient recovered vision to the remainder of the field of vision in the right eye. Movement and vision to the eye was restored and while not aesthetically returning to its previous state, the eye itself has regained nearly full function. 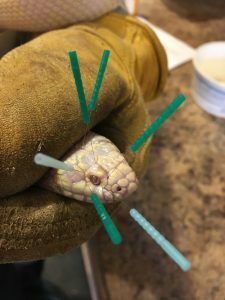 No adverse effects were noted during any acupuncture sessions and the zookeepers remark that Terry’s eye if fully stable and retains normal function.